Each week, the Redding Record-Searchlight offers a “question of the week.” Our lay leaders Art Tilles and George Wandrocke regularly contribute to the Saturday interfaith question section in the Record Searchlight religion page. Clergy from various traditions are asked to give their faith’s position on issues of current interest. Go to www.redding.com/news/voices-of-faith for the latest question and responses. TBI has been represented on SCIF for many years. It has only one agenda; to provide a place for dialogue among representatives of numerous faiths in the Redding area. SCIF’s web site is www.shastacountyinterfaith.org/ . 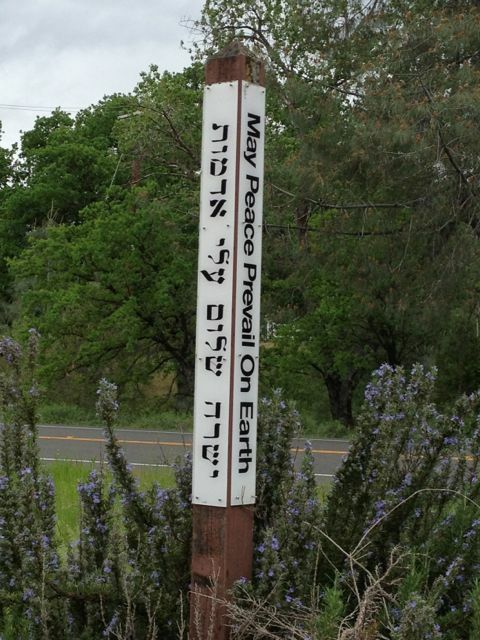 In 1999 after long time Redding area residents, the Williams brothers, were implicated in three synagogue arsons in Sacremento, the Redding Interfaith community came together to show support for our Jewish presence in Shasta county. As a community we planted a Garden of Healing. Their support is symbolized by this marker donated by the Quakers. Periodically, a TBI member lectures on Judaism at the History of World Religions class at Shasta College taught by Dr. Jim Horton, a Methodist minister. It’s a welcomed opportunity to present Judaism in a light that is often missed in the Christian world. Our session focuses on the contrasts between Jewish practices and Christian practices. Students from the class often come visit services at TBI as part of their studies. Genocide No More: Save Darfur! This group of Shasta County residents is committed to stopping the genocide in Darfur and raising funds quickly for humanitarian aid to the millions of Darfur refugees. We network with other organization, hold monthly prayer vigils on the Sundail Bridge, and hold letter writing parties, as well as sponsor and participate in other activities to raise awareness of the genocide in Darfur. Our web site is www.darfurredding.org.